esilience assessment allows targeted management, and many low Pacific island atolls have no baseline condition data or monitoring, and are threatened by sea-level rise. Ecological resilience is a useful management concept where an ecosystem risks losing its ability to recover, potentially driving itself to an undesirable state, which for atoll shorelines is beach erosion without recovery, and mangrove dieback. 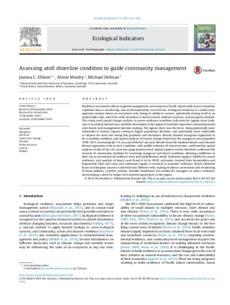 This study used spatial change analysis to assess resilience condition indicators for lagoon shore habitats of an atoll protected area, methods developed in the region to facilitate improved community based assessment and management decision making. The lagoon shore was the focus, being potentially more vulnerable to human impacts owing to higher population densities, and potentially more vulnerable to relative sea level rise owing low gradients and elevations. Results showed mangrove vegetation to be in healthy condition, and spatial analysis of coastal change found that the mangrove area expanded 1998�13, increasing by 17%, at a rate of 604 m2 per year. Results from the southern beach coast showed littoral vegetation to be in poor condition, with profile evidence of recent erosion, confirmed by spatial analysis results of loss of a previous progradation trend. Spatial analysis results therefore confirmed the veracity of community methods for assessing mangrove and beach condition, allowing confidence in their use in assessment of resilience state and rehabilitation needs. Sediment supply is helpful to coastal resilience, and analysis of beach sand found it to be 99.9% carbonate, derived from foraminifera and fragmented shell and coral, and continued supply is essential to maintain resilience. Beach sediment from such biogenic sources is derived from offshore reefs, making resilience assessment and monitoring of those habitats a further priority. Suitable timeframes are needed for managers to assess resilience, necessitating a need for longer term monitoring projects in the region.